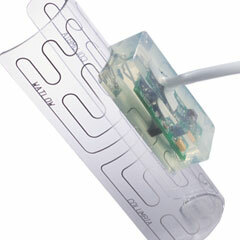 The syringe heater from Watlow was developed for the unique needs of medical injection applications. The heated syringe provides a heated fluid and drug delivery solution that maximizes patient comfort while reducing risk. The versatile Watlow heated syringe system produces consistent results by reducing temperature and viscosity variations. Heater configurations include silicone/wire or polycarbonate/foil configurations to deliver flexibility and convenience. Both heater forms are designed to "snap" on to the syringe with one hand and hold firmly during the procedure. The polycarbonate/foil configuration is constructed using a clear polycarbonate laminate, which allows technicians to view fluid levels and monitor for air bubbles. Smooth outer surfaces and a radius on all inside corners facilitate cleaning. The syringe heaters also house an overmold containing an electronic controller and/or sensor to deliver years of accurate, trouble free service and warm solutions to precise specifications. Redundant controller may also be incorporated if required. Precise fluid temperatures greatly increase patients' comfort levels. Body temperature injections are more easily introduced to patients and have reduced viscosity. Heated contrast media minimizes patient risk and is particularly beneficial for patients in a frail or distressed condition.